June is (going to be) busting out all over!!! It’s been a cold spring. Or at least that’s what I keep telling myself. For the last 5 years it seems like we are just a tiny bit ahead of WildRootsHomestead in Alaska. I know we aren’t, but it feels that way, when I see other folks posting photos of open poppies, and day lillys that are almost bloomed out. Here are our dallias. Well, some of them anyhow. We have about 120′ row of them growing all down a fenceline, and when they are blooming, they are beautiful. It just seems like it takes f. o. r. e. v. e. r. for them to get rolling. Same with the garden. And I’ll show that to you in another couple of days. So, what’s blooming in your neck of the woods? So far we’ve seen the dandy-lions and fruit trees. Oh, and the trillium make their show again. This entry was posted in Farmer Adam and tagged Farm Photography, friendly farms, Photos, Small Farming, small scale farming on June 9, 2012 by adalynfarm. This entry was posted in Farmer Adam and tagged Family, farm photographer, Photos, Stanwood on December 24, 2011 by adalynfarm. “the missing frame” or beekeeperfail…. Just a quick pic from the ol mobile phone, and description…. Those on FB will have seen this already, but to describe it a bit more.. I have a hive at a friends house, near the farm, but close to some better nectar sources… One of the frames in the bottom super was all torn up, so I had pulled it, with the intention of returning and dropping in a replacement… And life happened and about a week went by. When I pulled it out the bees had moved on without me. As in, had pulled down comb and ‘replaced’ the frame. I was able to salvage it though. I used an old empty frame, and some wire to wire the ‘home drawn’ comb into a frame. (for what it’s worth it’s a state requirement that bees be kept in hives with moveable frames so they can be inspected for disease, so in some ways I HAD to do something). Edit: the bees moved on as in, they kept working. 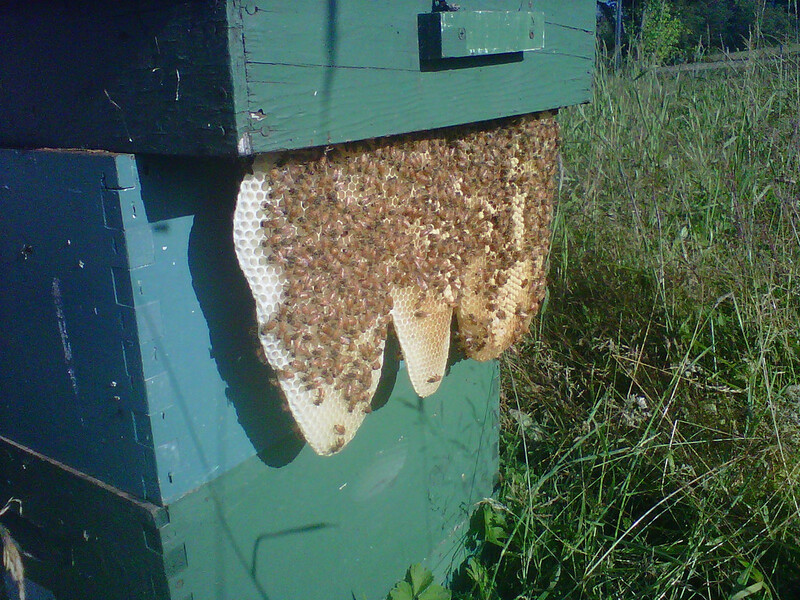 They are still in the hive and doing well, all that honey comb in the photo above is proof of that! This entry was posted in Bees, Farmer Adam and tagged Beekeeping, local produce, Photos, small scale farming, Sustainable farming on August 23, 2011 by adalynfarm. 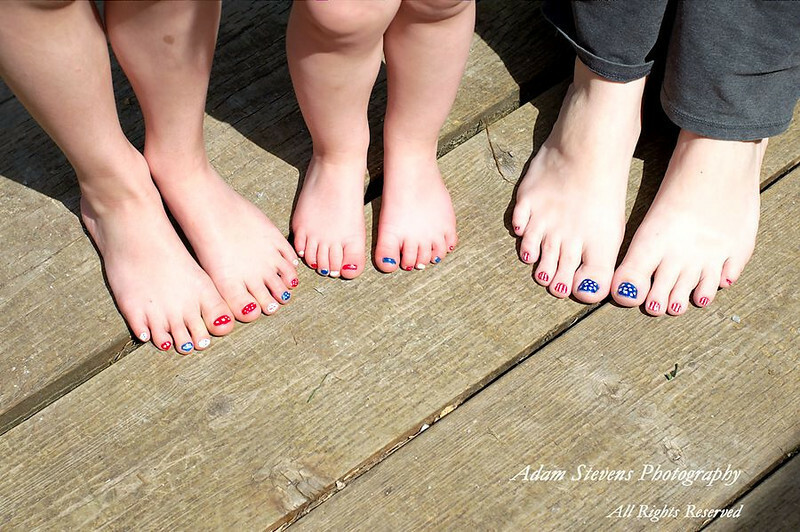 There is a hymn about the father’s love for us… Seeing my wife’s toes last weekend I though of how deep her love is for her girls. 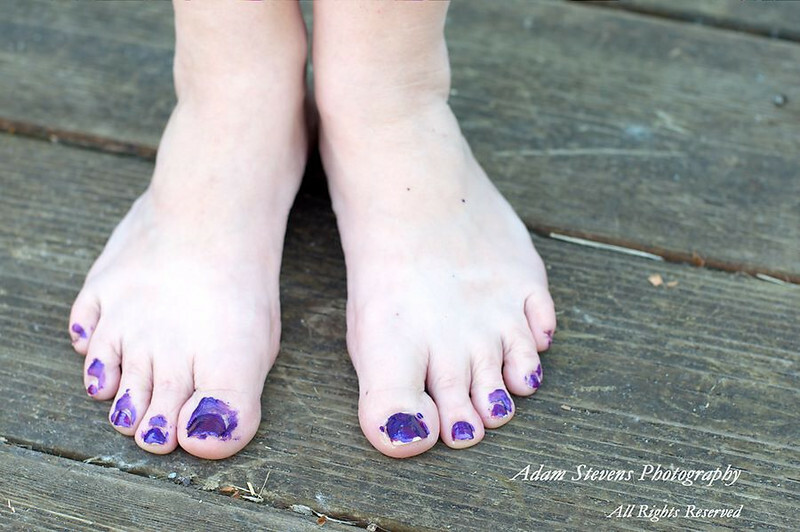 Our eldest wanted to paint her toes. To give her a ‘special spa day’. For a first try, I think she did OK! I was happy to help with some touch up. And with the 4th just around the corner, a ‘re-do’ was easy to explain. The girls picked their color scheme. Almost as cute, watching the two year old almost walk into walls as she admired her toes. This entry was posted in Farmer Adam, Farmer Joscelyn, Messin' around and tagged Family, Photos, Small Farming, Stanwood on July 8, 2011 by adalynfarm. Then we has a friend with a sad story of a nasty neighbor and chickens and ducks with broken legs. Yes. Really. We offered our farm as a haven for the critters till the folks could find another place to move to. They covered the feed cost, and we have gotten to keep the eggs. Not all bad really. The one down side, more goose yelling about things that freak out geese. And with almost a dozen of them now either nesting or trying to be the protective papa, unless you are standing close enough to touch each other, you can not carry on a conversation outside… And yes, there is a bit more poop. Let’s just say, that pasture is gong to be get a good rest before we run anything on it. As for size, these grey guys do get big. This guy could pull my wallet out of my pocket, and keep his feet flat on the ground. This entry was posted in Critters, Farmer Adam, Messin' around and tagged farm photographer, farm photos, Geese, Goose, Photos, Spring farming, Sustainable farming on April 25, 2011 by adalynfarm. We, however do have a turkey in the straw. We have three Royal Palms (ALBC link here) that are more pets than food. “Duke” and “Earl” have been with us for some time now (See T-day post from two years ago), and last fall, in an attempt to establish our own breeding flock, we purchased three ‘hopeful hens’ from a great guy up in tulip country (Skagit Valley). Two ended up being toms (who knew?) but “Duchess” has been popular and although not as friendly as the boys, it’s nice to see a turkey who is a little more about business than showing off. She started laying this spring as they days got a bit longer (next year we will take better farm notes) and would leave the eggs all over the pasture. They are a bit bigger than a chicken egg, with a bit more of a goose flavor (our Turkeys eat lots of grass). I had been gathering them so the crows wouldn’t get any ideas, but when she started getting some consistency in her drop zone, I began pushing them into one spot. She ended up picking a corner of the old loafing shed for her nest, and last time she was off them I counted 14. These pictures are from a couple weeks ago, and for the past 14 days or so, she hasn’t been off the eggs for more than a drink of water and a bit of grass and feed. Oh, and the funny part? We weren’t sure if she was going to start sitting on the eggs, so Farmer J ordered up a batch of Royal Palms at the Country Store and as she pulled past the turkey run, saw Duchess sitting on the eggs for the first time… I suppose that’s all well, as having a bigger gene pool can’t hurt. This entry was posted in Critters, Farmer Adam, Food and tagged farm photographer, friendly farms, Pastured Poultry, Photos, Putting up, Turkeys on April 12, 2011 by adalynfarm. We have a great garden in this year. And on the advice of my dad, I planted a bunch of radishes… They come up super quick and with an antsy preschooler that’s a good thing. We went out a few weeks ago and snagged the first couple of radishes for a dinner salad. Crisp and yummy! She said I had to put one up on the blog. So everyone could see it. And yes. It’s just a little bigger than a blue berry. This entry was posted in Farmer Adam, Food, Veggies and tagged farm photographer, local produce, Photos, small scale farming, Stanwood on June 4, 2010 by photobby.